Free every day EXCEPT Monday 6th August when we host the IWW Wrestling event. Admission on 6th August is €3 per person big or small. Ages between 13 and 18 years have reduced entry rate of €1 every day, EXCEPT Monday 6th. Admission is €3 for adults except on the weekdays, Monday 30th July to Thursday 2nd August, when the admission reduces to €2. Note: Independent Vendors located within the Scarecrow Village charge their own rates for the use of bouncy castles or games etc. This is at their own discretion and does not fall under the responsibility of the Durrow Development Forum. Adults admission is €2 both weekends but will reduce to only €1 from Monday 29th July to Thursday 2nd August! And again, children go free to all our events, except IWW on the Bank Holiday Monday 6th August. Adults admission is €2 and children and teens go free. 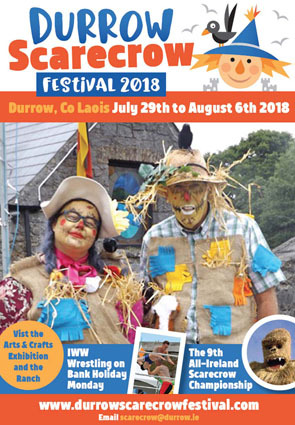 Scarecrows are on display throughout the entire village of Durrow, every day, and you are free to walk around and take them all in. Enjoy!